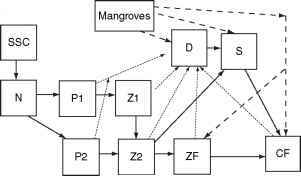 Figure 3 (a) The ecology submodel for tropical Darwin Harbour, Australia. SSC, suspended solid concentration; N, nutrients; P, phytoplankton (two dominant species with different turnover rates); Z, zooplankton (two dominant species with different preys and turnover rates); D, detritus; S, detritivores; ZF, zooplanktivorous fish; CF, carnivorous fish. The mangrove swamp is modeled as a source of detritus as well as a source of young detritivores and fish (thick broken arrows). At death all organisms become detritus (thin broken arrows). (b) Photographs in Darwin Harbour of pristine mangroves in traditional Aboriginal land on the west bank (left), aquaculture industries encroaching in mangroves in the southern region (middle), urbanization and port development on the east bank removing all natural habitats (right). in quality and quantity of terrestrial runoff lead to reef degradation by generating phase shifts - the process by which areas formerly dominated by corals are overgrown by algae; and (2) is the reef capable of sustaining or rebuilding its biodiversity by self-seeding if remediation measures are implemented on land and in rivers to moderate the human impact? The estuarine ecohydrology model has been modified and applied to coastal coral reefs that are subject to human impacts from (1) land runoff resulting in an increase in suspended sediment, increased water turbidity, and increased nutrient concentration, and (2) from global warming resulting in increased bleaching events in summer. The coral reef physical submodel (Figure 6) is more complex than that of estuaries because it considers also river floods and tropical cyclones that both negatively affect coral reefs, and the oceanographic connectivity between reefs that enable self-seeding as well as the connectivity, that is, the exchange of coral planu-lae between reefs. The biological submodel (Figure 7) is based on the competition for hard substrate space between the algae and the coral. The coral is preyed upon by crown-of-thorns starfish, whose population dynamics is also modeled. Algae are preyed upon by herbivorous fish that in turn is preyed upon by carnivorous fish that is harvested by people. Suspended sediment concentration (turbidity) and nutrients modulate all these processes. Additionally the success of recruitment of juvenile coral decreases with increasing algal cover on the hard substrate. Global warming results in an increased mortality of adult corals.